If you need to remotely access your iPad for work, you’ll need a VNC. A sophisticated VNC/RDP client app is PhaseFive Systems’ $14.99 Jump Desktop. It has more configuration features and is easy to set up. If you download the Jump Desktop app for your Mac from the site, it’s free. If you get it from the Mac App Store, it costs $30. That’s because the one at the Mac App Store is both a server and a client. Because the Mac can act as a VNC server, the only reason to buy the Mac App Store version is to get the easier sign-in process from other devices to your Mac. The easy way to use Jump Desktop is to download the free server app for your Mac or PC. The app does all the work for you in a wizard if you click the Automatic Setup button — but note that you must have a Google account to use the Automatic Setup option. For manual setup, click Set Up Your Computer instead. On your iPad, open the Jump Desktop app and enter your Google account email and password when requested. As soon as your computer is set up, and Jump Desktop is running on both your computer and iPad (and both are connected to the same network or to the Internet), you see your computer listed as available in the Jump Desktop app on your iPad. You can use Jump Desktop on your iPad to remotely access your computer without installing the Jump Desktop server app on your computer. If you’ve set up another VNC or RDP server on your computer, you can use its IP address and password from the Jump Desktop app instead. For example, if your company has set up VNC or RDF on its computers, you can choose to use Jump Desktop to access your work computer instead of whatever client IT gave you — or if it provided no iPad client. Jump Desktop on the iPad also supports iCloud, so you can keep your connections synced across your iOS devices and Macs. The Jump Desktop Settings window also gives you control over many aspects of the app’s operation, such as how gestures map to mouse operations; whether Num Lock is automatically turned on for RDP servers (meaning Windows); the capability to prevent the iPad from going to sleep while you’re using Jump Desktop; and the capability to reconnect automatically should your connection get lost. You can also enter your Google account credentials if you didn’t do that the first time you ran Jump Desktop. To get to the Jump Desk Settings window, tap the Settings button (the gear icon) at the upper right of the screen. Tap a connection to remotely access that computer. When requested, enter your password. “Which password is that?” you ask. “I didn’t set up a password for Jump.” No, you didn’t: The password is the password used by your computer when you sign into it, if one is set up there. On a Mac, you must also enter the username set up for your Mac. Jump Desktop for Mac relies on the Mac’s built-in Screen Sharing application, which Jump offers to enable for you during setup. If Screen Sharing is not running when you use Jump Desktop, you can launch it by searching for it in Spotlight and then opening it there. Or, choose Diagnostics from the Jump Desktop menu in the menu bar to open the Diagnostics dialog. Click Fix It if it appears next to Screen Sharing in the dialog. At the top is the toolbar, with buttons (from left to right) to open the onscreen keyboard, close the connection, hide the toolbar (pull the handle down that appears at the top of the screen to get it back), fit the computer’s screen to the iPad’s screen, set gesture and mouse options, and (again) open the onscreen keyboard. As you move your finger on the screen, you see a larger circle follow you, to help you more easily find the pointer above it. Although Jump Desktop doesn’t match the pointer’s location to your finger’s location on the iPad’s screen, that circle is always the same distance from the actual pointer, so you can quickly select items and navigate them. To get a sense of how gestures translate to mouse operations, tap the Options button (the wrench icon) and then tap the i icon to the right of the gesture profile in use. (Standard is the default.) You learn, for example, that to move a window, you tap twice quickly, holding your finger down on the second tap to start dragging the object. 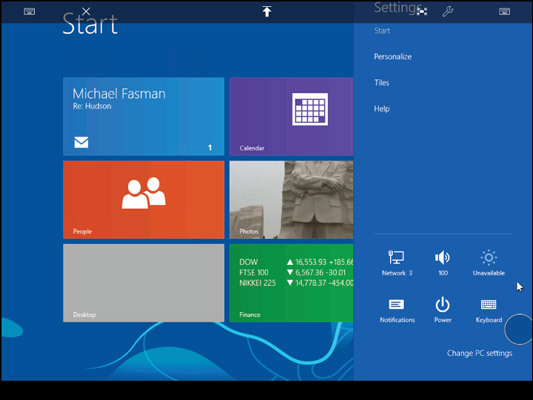 Jump Desktop struggles, as do many PC owners, with getting Windows 8’s Charms bar to appear. It’s hard to position the pointer in that lower-right corner far enough and then hold the position to have the Charms icons appear so that you can open them. But it is possible: Just keep trying until it works. 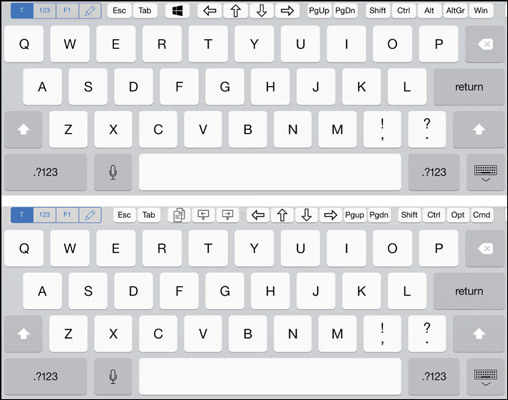 Jump modifies the iPad’s onscreen keyboard to add special keys for Windows or Mac, depending on which computer you are remotely accessing. As you can see, they add computer-specific keys in an added upper row that you’ll need to use shortcut commands.